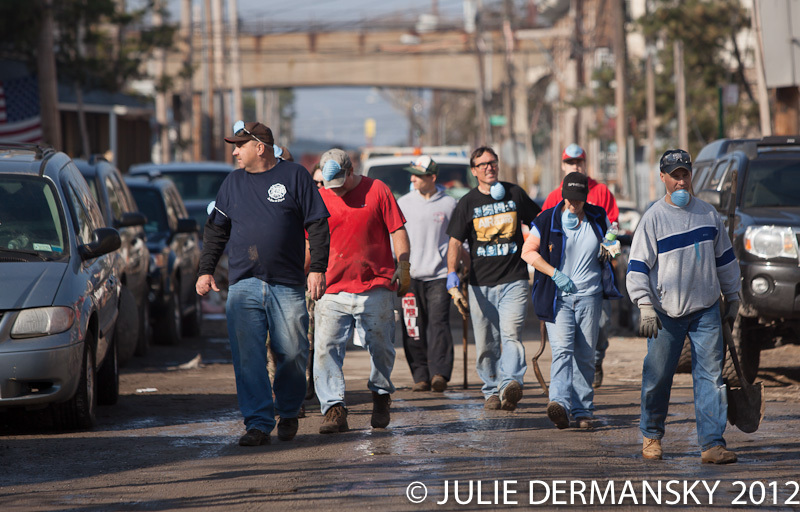 Good Samaritans have come to the aid of those hard hit by Hurricane Sandy. They shovel sand out of basements, deliver meals, and supply stricken communities with pet food, medicine and legal advice. 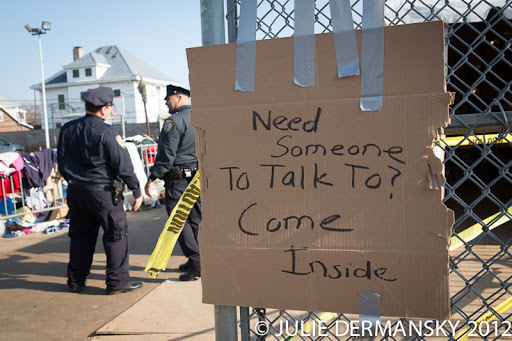 FEMA and the Red Cross are not easy to find in the post-Sandy landscape. But Doctors Without Borders, Occupy Wall Street and lesser known groups like Punishers Law Enforcement Motorcycle Club from upstate New York and Michigan’s Movement for Peace.Org mobilized quickly and went right to work. Occupy Wall Street has been a leading force in the relief effort. 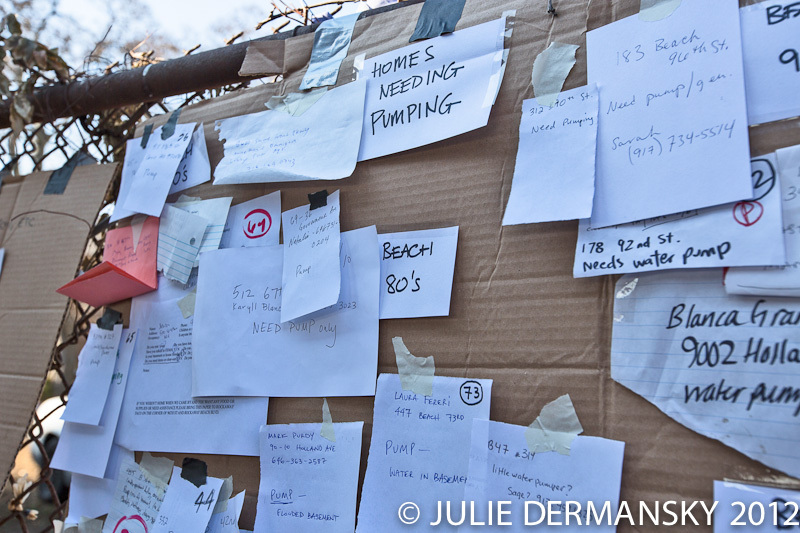 They set up the website OccupySandy.org that people find via Facebook. 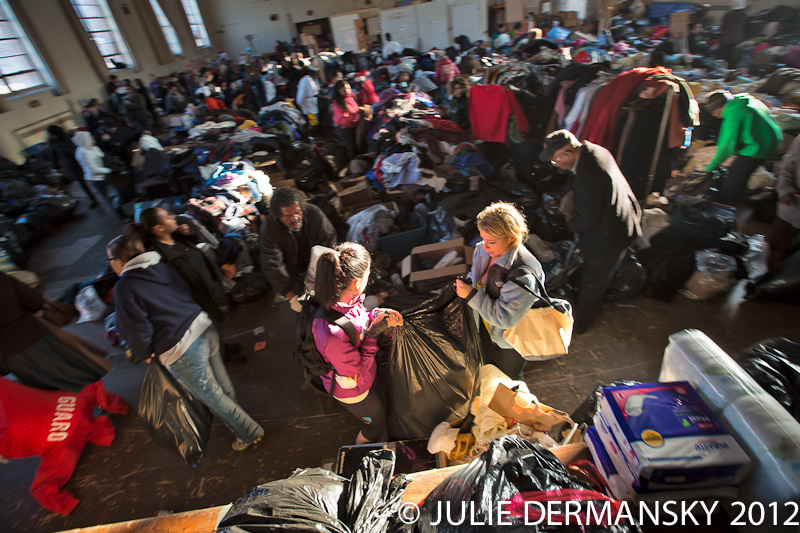 Donations have poured in and they quickly coordinated volunteers, sending them to areas where people need help the most. 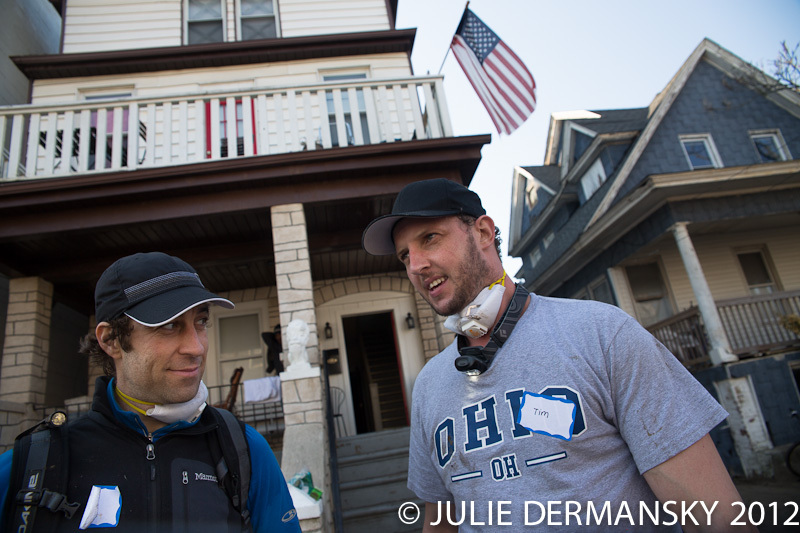 Team Rubican, veterans who pair their members with civilians, go out and help with the dirtiest parts of recovery. 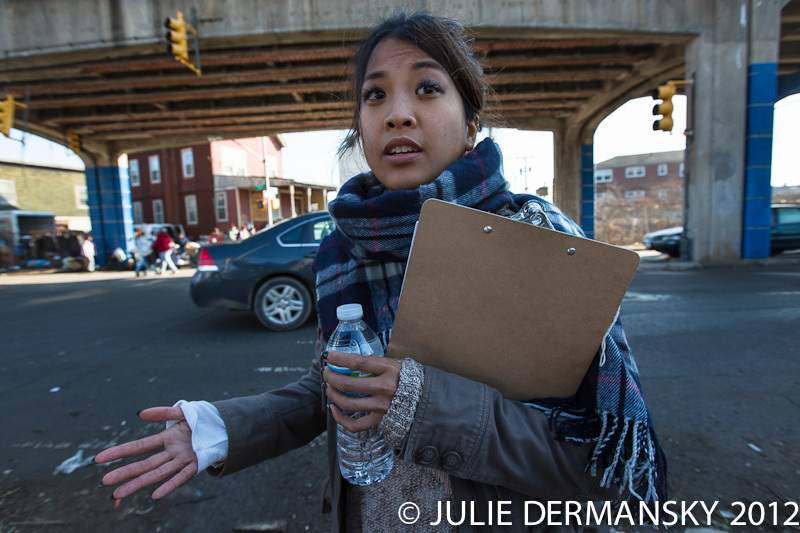 Nicole Green, an ex-Air Force officer, says vets are well suited to help in chaotic situations. 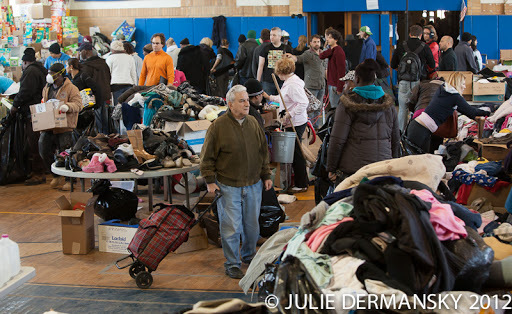 Rockawayreleif.org is one of several sites people are using to find out where they can go to help. New Zealanders Craine Knowels and Tim Huse hooked up with a group called The Rockaway Renegades on Facebook and spent Sunday digging out basements. Huse said the earthquake that hit New Zealand taught him it takes years for people to recover from a disaster. 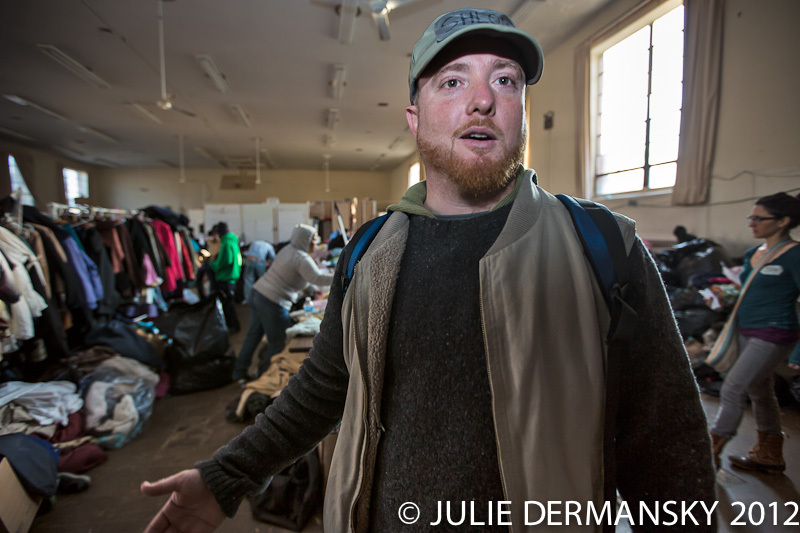 Community leader Kevin Foley told group form Southbury, CT’s Pomeraug High School, “It is time to get your hands dirty.” The 25 volunteers came to the Rockaway’s with shovels in hand going door to door to dig out basements. 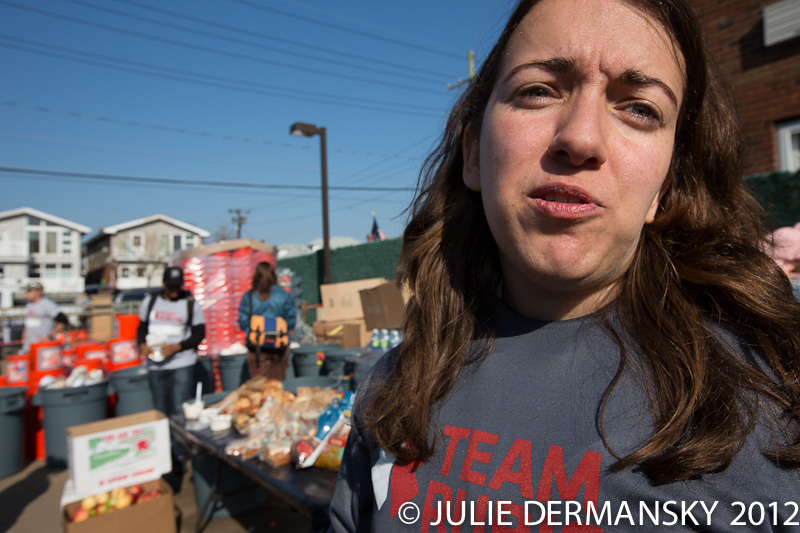 On the corner of Beach Channel Drive and 44th Street I found five friends who surf in the Rockaways feeding people. 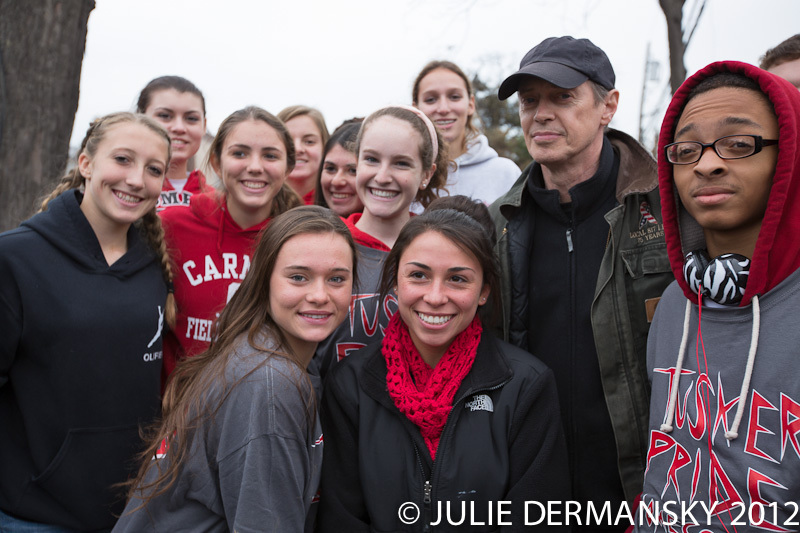 They came equipped with grills, 500 burgers, 500 hot dogs and ten pounds of rice and beans. I met Suzanne McCrory, whose house is close to the beach in Belle Harbor. 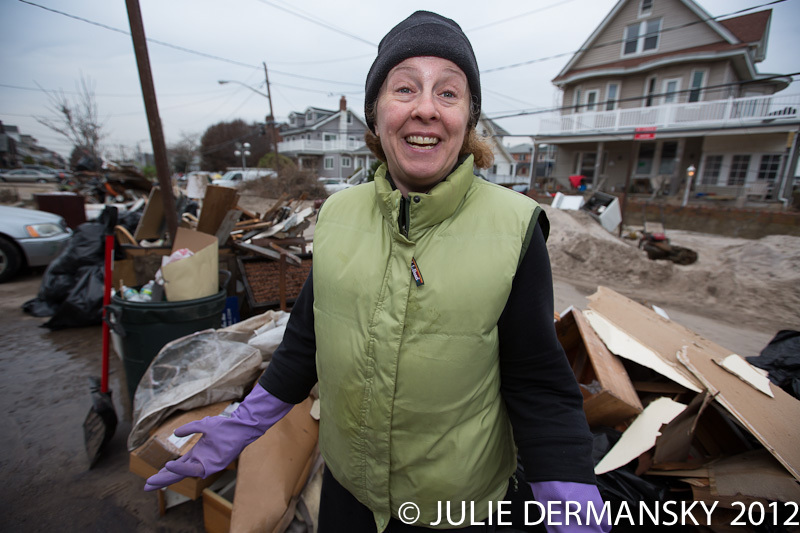 Volunteers were cleaning her basement, hauling out furniture and building materials that they piled on the street. I asked her if she knew who was providing the help. 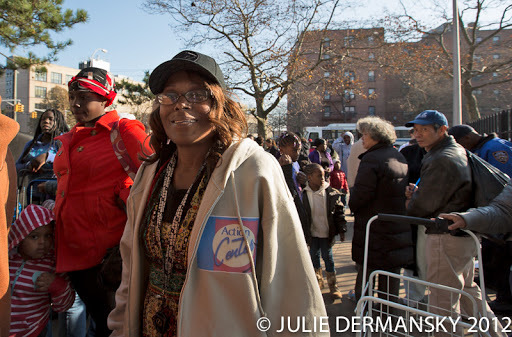 She smiled and shrugged and said she didn’t know who they were, but said they were doing great work. St. Francis De Sales Church now a disaster aid station. 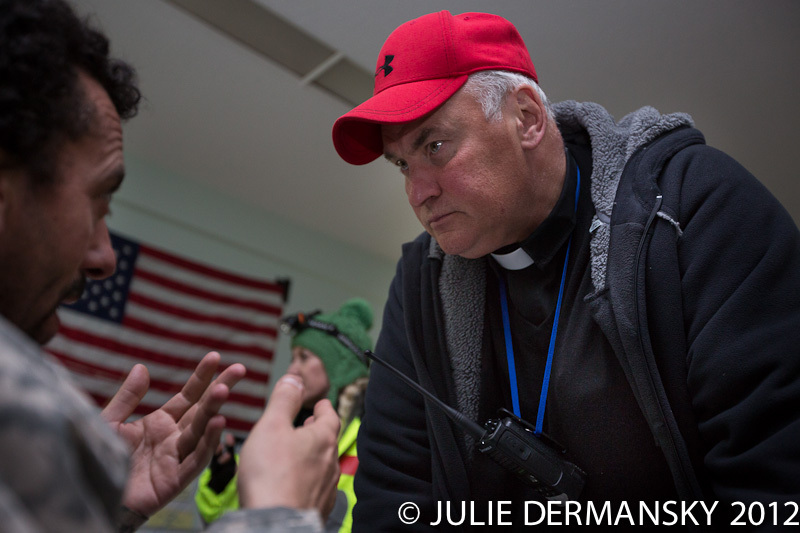 Monsignor Brown at St. Francis De Sales Church in Belle Harbor talks to Oscar Gubernati, with a background in disaster relief who is running a makeshift disaster relief operations from the church . Anji Crane from Baton Rouge LA used Rockawayreleif.com via Facebook to find out where to help. 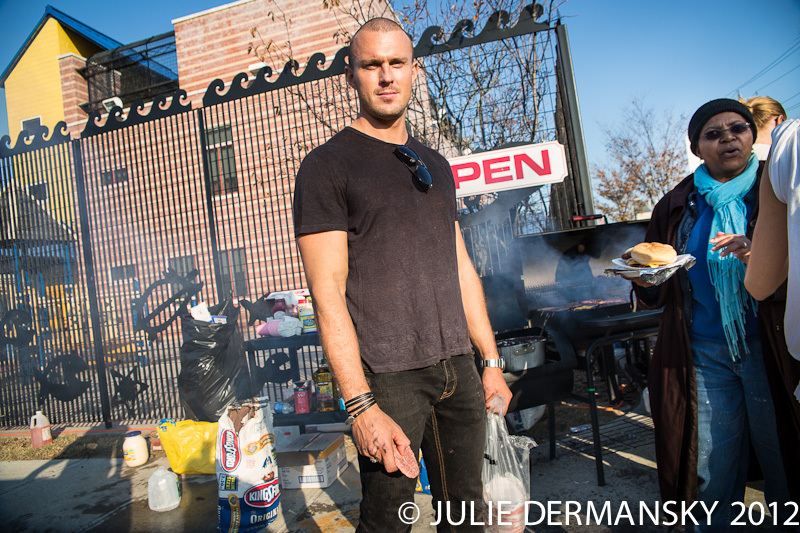 Surfer, Juris Kupris grills hamburgers for anyone who is hungry on a the corner of 44st and Beach Channel drive. Thank you for posting pictures. I am a teacher at a small Catholic School in Urbandale, Iowa, St. Pius X School PK-8. We are using our February Mission Awareness to raise funds for the families of the students at St. Francis de Sales in Belle Harbor. 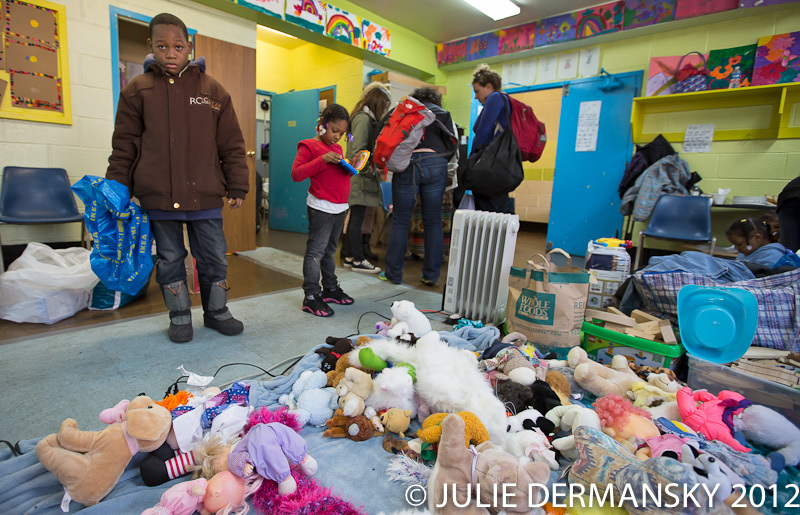 I am working on putting together a video of pictures to help our students better understand the sufferings of the children and families in Belle Harbor to rally their piggy banks and parent's check books to help out our fellow people. We have been in contact with Sister Patricia at the school to get details as to how best to help. We are having a funds drive on February 22nd to raise funds to purchase gift cards that will be donated to the families. I am wondering if I can I please have your permission to use your photographs in our school video? It will be seen by students at SPX to help us rally our kids to support others in need. Your pictures seem more personal and appropriate for our school aged children. 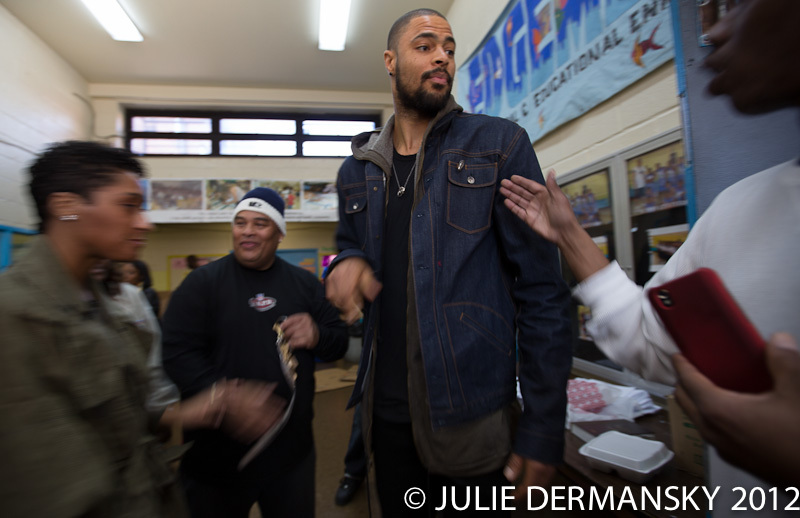 Do you happen to have others that are taken at the location of St. Francis de Sales School/Church? Please let me know and you are free to respond here and I'll give you my school email account.